Due to recent increase in demand, current lead time is approx 4 to 6 weeks. Thank you for your patience. If you have an upcoming deployment or training, please let us know in the message box at checkout. See sizing and measuring instructions below. The Minimalist Belt is a low profile and comfortable belt for work or leisure. The 1.75″ belts are constructed from Type 13 parachute webbing, just like our other Cobra Riggers belts, only this one is single thickness. 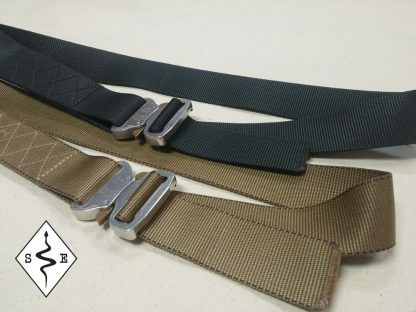 The 1.5″ belts are made from firm webbing similar to dive belts. This belt still has the 2″ opening behind the Cobra Buckle for clipping carabiners into, and is every bit as strong as our Cobra Riggers belts. The Minimalist belt will not offer enough rigidity to support a pistol outside the waist band. However, this belt is an excellent way to carry inside the waist band, especially in the appendix position. All belts are made to order based on your waist measurement. Watch the video below for sizing instructions. I’ve had a few “tactical” belts which cost more and this is by far my favorite. It’s low profile and great for my every day carry. Also you can’t get any better than a Cobra buckle. This belt is awesome! 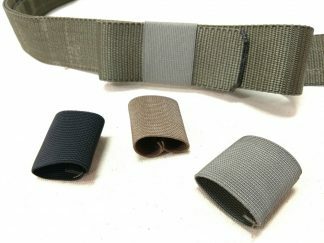 I was looking for a belt that wasn’t as stiff as a riggers belt to wear when I carry iwb. The cobra belt buckle is great as it allows you to have infinite adjustment. Chris’s craftsmanship is top notch! This belt will last you a lifetime.